These are my actual pajama pants. I really like how the thin jersey moves and almost looks silky and flowy. Today I wore them out with a pair of pointy heels and an oversized vintage blazer. I love grey on grey! Another very successful minimalistic outfit. That bag is simply awesome! Love the entire look too! as per usual you look fantastic! So comfy and chic! Loving the self-made tote. How is it that you are able to make something like pajama pants look so cool! LOVE this look. I also have that aa tir-blend shirt and I am too wearing all grey today. I love it!! I have thought for a long wearing pyjama pants to go out, just didn't find yet the right way to wear them out. Anyway you matched them well, I like the different shades of grey of this outfit and the touch of white added thanks to your blazer and your shoes :). Mooie grijstinten! en die tas is gaaf! Alles staat je zo goed!! I love this bag. every moment. Your pants looks so comfortable, and pairing them with your coat turns the outfit into a very elegant look! Oh, I love everything ! 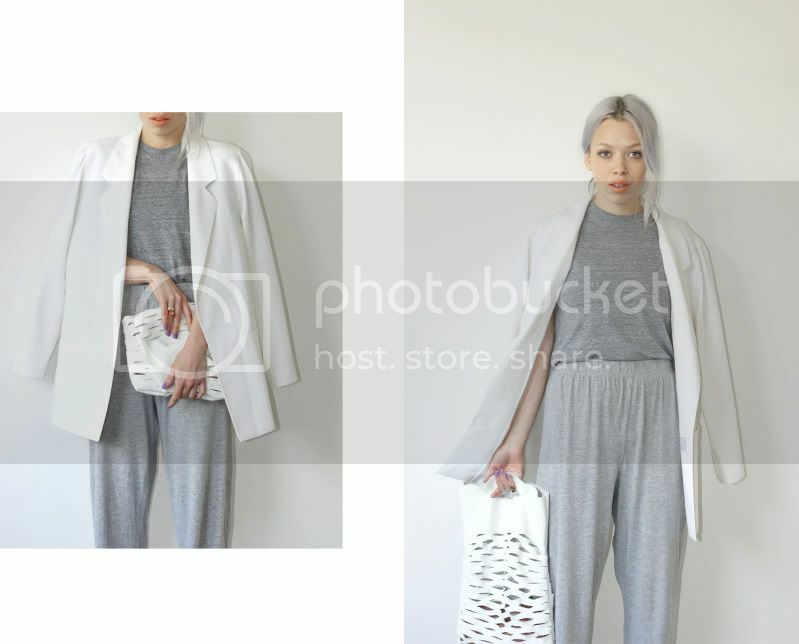 Oversized jacket, perfect size of your pyjamas, and grey and white combo! Perfect ! Have a nice week-end, Françoise. I like that you match the jersey pants with high heels! an amazing outfit! I´m still in love with your bag! So cool and stylish! Love ur bag! You look absolutely amazing. you are so inspiring i love this outfit so much! die broek is echt geniaal en een super goed idee, ik wil 'm in het zwart! Girl, u know how to work basics!! The pants look very nice :) Though a little long... I'd always be affraid of ruining them by stepping on them all the time. I adore this look, those pants are great. this must be one of your best outfit.i like the way how u keep ur looks clean and minimal yet so stylish. You are probably the only one who can get away with this outfit. It looks really good on you. You're really one of my greatest inspirations. Thanks. A lot of times it's very difficult to get that "perfect balance" between usability and visual appearance. I must say you have done a amazing job with this. Additionally, the blog loads extremely fast for me on Chrome. Exceptional Blog! I'm really experiencing the template/theme of this web page. It's easy, yet efficient.